Night photography is a study of its own. Night photography requires a very different approach to photography in the day. Once you’ve learned these differences, you’ll be able to capture amazing photos. The class will cover a range of principles, including long exposure, flash and shutter speed. You’ll learn how to use your equipment and adjust your settings to take photos after dark. This class takes you on a walking tour around Adelaide, starting from Elder Park, so you can practise your newfound skills on your surroundings. By the end of the class, you’ll have created your own stunning nightscapes. Your experience doesn’t stop once the class ends. 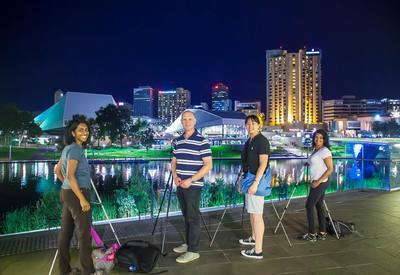 You can share your photos with your peers on the Photoh Facebook page, and there's also a Adelaide Photography Group where members can exchange photography tips, ask questions, receive constructive criticism on photos and discuss upcoming events. Class sizes are kept small so each participant will have a chance to interact with the host on a one-to-one basis. There will be a substantial amount of walking involved that night, so please wear comfortable shoes and bring an umbrella should the weather call for it. Let Photoh help you create beautiful moments with every click of the shutter.If you'd like to book for a date that's not listed we can arrange a private class or group class to suit your needs. Chris was fantastic! Very patient and it was really easy to understand. Plenty of practice during the class. On a cold and windy evening, Mark helped me understand how to use my camera and the strategies for taking better night photos. We went through a variety of scenarios to learn how to make best use of my camera’s features. Thanks Mark. It did what I wanted it to do; taught me how to take night time photos. Now I need to practice to get it right. Very informal which worked well with a small group. Mark was very nice and helpful. Enjoyed the course, a fair bit going on in the city and quite noisy which made hearing what Mark had to say a little difficult at times. But overall very good thanks. It was a pleasure to have been able to attend this course. Mark was very informative, and certainly knew his stuff. Overall, a very good night. Mark was very knowledgeable and helpful - able to advise on a wide variety of photographic issues. Clear and easy to follow. I loved it. Learnt a handfull of tips and ideas which will improve my photography and it was presented in a professional manner. The best . Most helpful. Honestly before I booked I never realized it was a beginner event. Otherwise I wouldn't have come. I am by no means a beginner and I really didn't see anywhere where it said it was a beginners event.. So I didn't really learn anything. Sadly. Mark was great, not his fault I didn't really belong there. I could have probably taught this class myself.. The course was very relaxed. Mark was very helpful, relating well to the group & the location provided lots of Photo Opportunities. Very worthwhile! Every one I spoke to after the course thought it was great. I was amongst a group of 5 from the Barossa Valley, & no one stopped talking about it the next day. A few of us took away some very good photo's. Enjoyed the night course. Informative, hands on, ran out of time as so much to photograph. Even though I have a reasonable knowledge of photography I am always learning and particularly interested in the night photography not so much of the beginners photography side of the night. The tuition was wonderful and I got a lot out of the session and am encouraged to do a lot more of night photography. I also learned a great deal about using manual and feel I made a big leap personally with photography. I am quite pleased with the photos I took last night. It was a fantastic experience. Group size was great, Mark was able to provide plenty of advice and suggestions. The experience has encouraged me to do more night photography and provided the confidence to shoot manual. What a fantastic course! Within the first 15 minutes I had managed to get some excellent night shots of Adelaide Oval and as we went along became confident experimenting with different settings. Mark was absolutely brilliant helping everyone in the group, offering tips and tricks and sharing his photographic knowledge. A quick lesson on light painting and then a chance to photograph the Cathedral at the end capped off the evening. Highly recommended. Very interesting night, Mark is informative and helpful. I will definitely be going on another course with Photoh. Loved it, loved it, loved it! Mark was patient, informative, he easily understood our level of expertise and taught to that. Not for one moment was I made to feel incompetent or slow. I ended my evening with some great shots and full of positivity about my photographing skills. Fab! The information gained has made me more aware of what is needed to photograph in manual mode and night photography. Thanks Maurice, you done well! Really loved the whole vibe, casual, informative, serious fun. I personally, learnt a lot so I hope I can retain the knowledge, practice, practice practice...... Thank you. Mark did well. Cheers.